Wayne State (3-3-2) kept their record at an even .500 with a non-conference split on the road at Bemidji State over the weekend. The Beavers used three, third-period goals on Friday night to romp to a 3-1 victory over the Warriors. 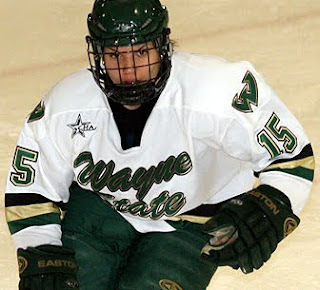 Wayne State’s lone goal came off the stick of freshman Julie Hebert at 5:19 of the third period. Fellow freshmen Lauren Ragen and Julie Ingratta assisted on Hebert’s third of the season. Mackenzie Thurston, Erin Johnson, and Frances Dorr scored for BSU. Delayne Brian stopped 21 shots, but suffered her first loss of the season between the pipes for WSU. Zuzana Tomcikova turned away 31 shots for BSU. Wayne State rebounded on Saturday afternoon, scoring a spooky season-high six goals, in a 6-1 Halloween drubbing of Bemidji State. Julie Ingratta started the onslaught with her second goal of the season at 2:09 of the first period. Dorr tied it up for BSU about four minutes later, but that was the beginning of the end for the Beavers. Micheline Frappier’s first of the season at 9:15 of the first proved to be the eventual game winner as the Warriors began to pour on the offense. Katrina Protopapas (pictured) scored on the power play in the second period to give WSU a 3-1 lead. The Warriors added three more in the third period to run away with the game. Alyssa Baldin scored on the PP at 5:41, freshman Lauren Ragen notched her first collegiate goal at 12:03, and then Protopapas iced the game with 12-seconds left with her team high fifth power play goal of the season. Lindsey Park made 31 saves in the WSU net for her first win of the season. Alana McElhinney turned away 18 shots for BSU. Wayne State finished up their 4-game road trip with a 3-1 mark and will host CHA rival and currently ranked #1 Mercyhurst at the City Sports Center this weekend. Friday's series opener is also Skate for the Cure Night, continuing the CHA's initiative to raise funds and awareness for breast cancer research.